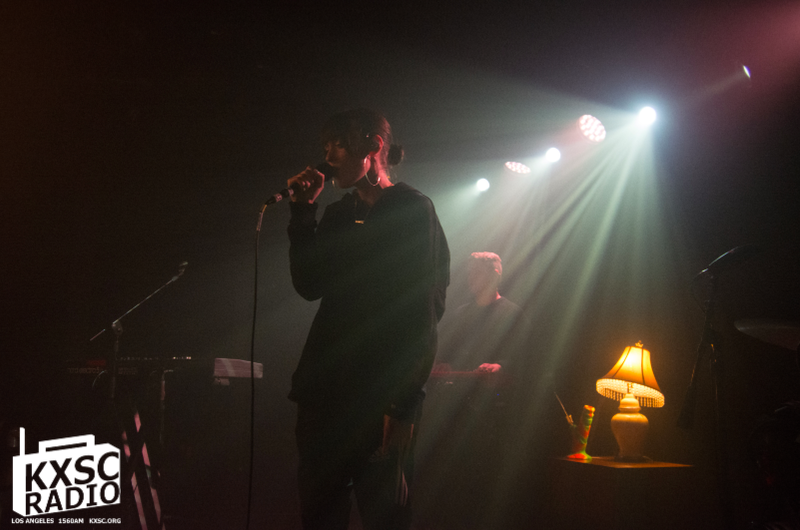 The Moroccan Lounge was the quintessential intimate setting to hear about heartbreak, being sad, and a growing understanding. The crowd slowly settled in so I snagged a spot front row at the side of the stage. Chloe Lilac took the stage wearing red joggers and a snug crop-top, part of her hair tucked up behind her head with a scrunchie. She had an air of comfortability amid her being seventeen. She spoke about writing since she was fourteen and she’s already appeared on tours with fellow youngster Charlotte Lawrence and now Sasha Sloan. Once she got started, she immediately loosened the rather tense crowd by encouraging them to do body rolls with her and start dancing. She debuted three new songs that were released that day in a collection called Heartbreak City Sessions. The songs make your mind sway as they’re dreamy and confessional. Lilac spoke about being sick and tired of the hook-up culture of “the city,” in which she is referring to Brooklyn (her hometown). Her sound and stage presence reminded me of Clairo. Chloe Lilac ended at a punctual 8:30 and Sasha Sloan took the stage. Her drummer Tyler Johnson with long locks took his seat with the lights on him and Danny Silberstein moseyed in on the keyboards and guitar. She emerged in the darkness. Her silhouette in the cloud of fog. She moved to the front and all you could see was her big, silver hoop earrings and her hair tucked in a simple bun. Like Chloe, she wore joggers, but this time they were black, just like her sweatshirt. Her voice is so desperate, full of pain, but unbelievably beautiful. It’s not surprising that since she is known by “sad girl sloan” that her EP is titled Loser. However, once you lay eyes on her you can’t help but think she’s anything but untouchably cool. That’s why it made me cringe a little to see two girls right in front of her throwing their bodies around and belting the lyrics only because Sloan’s power just took over and made you want to put yourself aside and let her voice in. Kudos to the girls’ passion though, because that’s usually me. She started Kygo’s song she’s featured on called “This Town”, which is about all of those around her growing up and getting married, when all she wants is to escape this and slow life down. When she played “Older”, which was about trying to understand her parents she had a moment by the piano where it was her immersed in her own world and she forgot about the audience. Throughout her performance she talked about struggling with leaving relationships and not knowing how to cope with that and growing up in a battleground of a household. She ended by singing “Runaway” and “Ready Yet”, which brought me back to around this time last year, when I truly felt heartbreak for the first time. She was so close, I wanted to tell her that she let me feel that pain and got me through that sadness. In between those songs, before Sloan sang “Chasing Parties” she prefaced it with being done with going out and getting too drunk and now, preferring sometimes to just get drunk at home. The song had more of a beat, and she told the crowd she couldn’t leave them without ending, in sad girl sloan fashion, on a sad song.